Stuart Jones, resident manager at the GoldenEye resort, tells Breaking Travel News how claiming the title of Caribbean’s Leading Boutique Resort at the World Travel Awards Caribbean & North America Gala Ceremony will help him welcome more guests to the prestigious property. 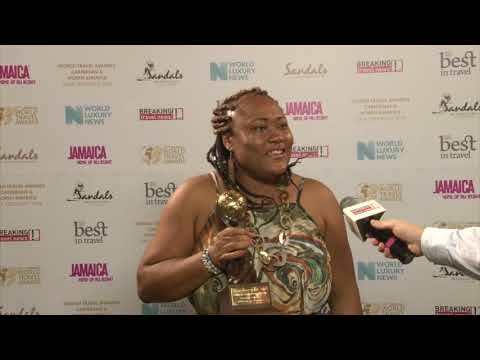 Talcie Neil, executive chef at the Fleming Villa at the GoldenEye resort in Jamaica, speaks to Breaking Travel News as the location is recognised with the title of Caribbean’s Leading Luxury Hotel Villa during the World Travel Awards Caribbean & North America Gala Ceremony 2018. April 2016 will see the vision of Island Records founder, Chris Blackwell, take one step further with the completion of 26 new beach huts on the luxurious Jamaican resort of GoldenEye. Designed by Jamaican architect Ann Hodges, the 26 freestanding one or two bedroom beach huts seamlessly merge outdoor and indoor living. GoldenEye in Oracabessa, Jamaica, was once the home of renowned author Ian Fleming. In 2011, Island Records founder Chris Blackwell re-opened the property as a resort and today it’s considered among the most luxurious and lush in the Caribbean. Island Outpost, Chris Blackwell’s award-winning collection of hotels & villa resorts in Jamaica, today announces Nick Simmonds as Managing Director of the highly anticipated re-opening of GoldenEye. The new GoldenEye Hotel & Resort, nestled in the village of Oracabessa Bay on Jamaica’s North Coast, will open this November.